Six-bedroomed Villa Beyaz is perfect for those seeking a luxurious and secluded holiday in an idyllic location. In Faralya. Six-bedroomed Villa Beyaz is perfect for those seeking a luxurious and secluded holiday in an idyllic location. In Faralya, a charming countryside village nestled in the mountainside above Oludeniz in Turkey is where you'll find this modern family-friendly villa. You'll enjoy breath-taking panoramic views of the sea and mountains, and you're within driving distance of popular resorts like Oludeniz. The interior is furnished and decorated with a sleek contemporary and stylish design. Think white-washed walls, light wood and natural-coloured linen with playful pops of colour. We love the floor-to-ceiling windows and doors that flood the villa with natural light and really showcase the magnificent views of the soft sandy coastline and impressive tree-lined mountains. At Villa Beyaz, the facilities are second to none. The villa comfortably sleeps up to twelve across its six spacious double bedrooms. There's an open-plan kitchen, living and dining area with more panoramic views and modern facilities like a four-hob built-in oven, dining table and two comfortable sofas adorned with soft furnishings for those cosy evenings in. Extra ‘luxe' features like an island in the kitchen, hanging lights and decorative pots add the bespoke finishing touches. 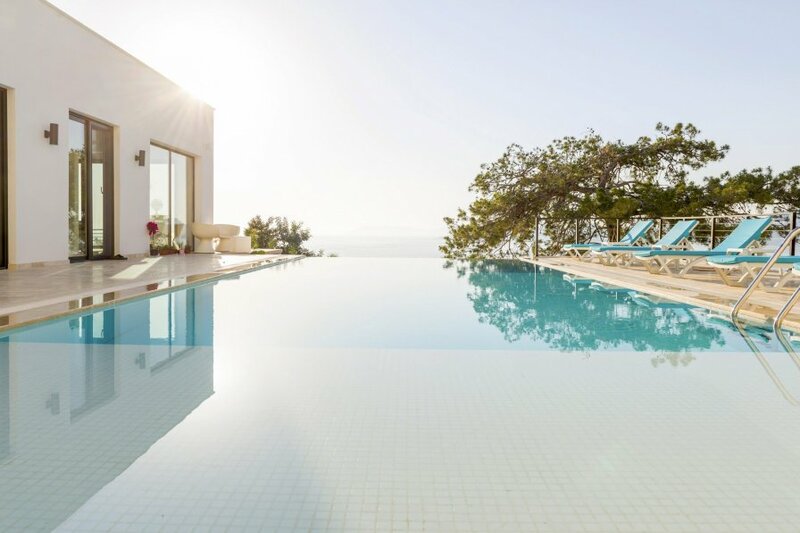 Outside, the pool and terrace is coastal facing and is completely secluded, meaning that you can sunbathe in comfort, knowing that you can't be seen from outside the property. The outdoor area is dotted with cushioned loungers, and you'll have no worries finding your prime spot in the sun or the shade. There are also several balconies where you can pull up a chair with your favourite book. The villa accommodates everybody's wishes: set in a peaceful spot, yet only 50m to the nearest Dolmus (bus) stop, 500m to the local market and restaurants where you try fresh local cuisine like Turkish Gozleme pancakes or pick up your holiday essentials, and there is a beach platform below the villa. Surrounded by stunning countryside you're ideally placed to explore this beautiful part of the Lycian coast. Villa Beyaz is a 6-bedroom villa, that overlooks the stunning countryside of Faralya, in Fethiye & Kayakoy. The bedrooms are scattered amongst a three-storey villa and an external annex. Villa Beyaz is in Faralya, a beautiful village in Lycia on the southern coast of Turkey. Known as the ‘village on the cliffs of the Butterfly Valley' it's just that: a majestic and peaceful rural location on tree-lined cliffs that are connected to the Butterfly Valley – a protected nature reserve with a secluded bay that's home to a myriad of butterfly species. Nearby you have the Zakros Hotel as well as a local 'bufe' market and Turkish Gozleme (pancake) houses. For exploring further, Faralya is also about 15km south of the popular holiday resort Oludeniz and 30km south of Fethiye. There is a Dolmus (local bus) stop nearby. 4.5km further along the coast is the bohemian Kabak beach with beach club, great for a day out. For outdoor adventuring, hiking from Ovacik, 2km north of Oludeniz, is an option thanks to the famous Lycian Way trail which passes through the main road of the village. You can complete this 16km section in one day or take two days with a night camping under the stars in the mountains. The trail also goes to famous sites like Kayakoy Ghost Village with abandoned Greek houses and a local restaurant – promising an ideal day out for both adults and children alike. In Oludeniz itself, you can visit the serene Blue Lagoon – a beautiful stretch of coast that was once a hideaway for pirates and smugglers. The crystal clear waters provide the perfect conditions for swimming, snorkelling and scuba diving. Look out for shimmering shoals of brightly-coloured fish or loggerhead turtles who nest in the area. There are plenty of diving schools, so even beginners can receive professional instruction from PADI-qualified instructors. Oludeniz also has a Blue Flag beach leading up to the lagoon. It's bordered by a promenade that's lined with local restaurants. Fethiye is only 13km from Oludeniz or 30km from the villa by dolmus, the local bus. Here, you'll find a marina where you can sit at the water's edge and sip an ice-cold coffee while you admire the Tomb of Amyntas, which dates back to 400BC. Fethiye is also home to a bustling bazaar every Tuesday, where you'll find everything from vibrant Turkish kilim (rugs) and local honey, to jewellery and handmade arts and crafts.